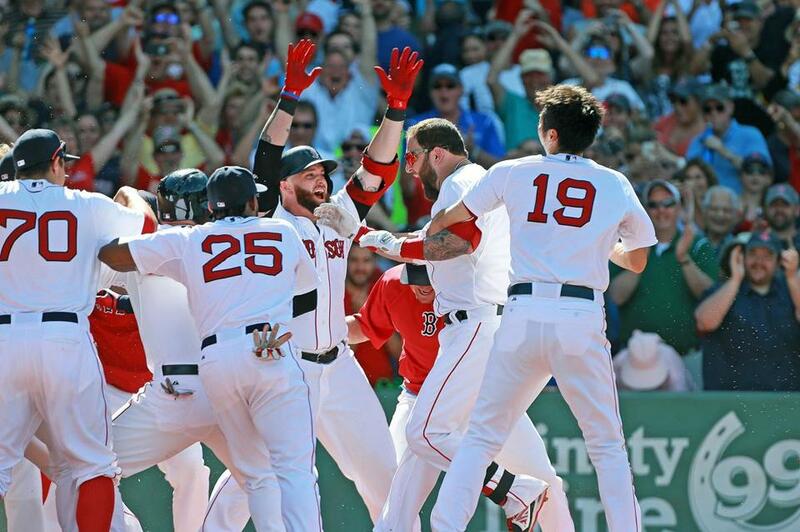 Mike Napoli (second from right) is mobbed by his teammates as he crosses the plate following his walkoff homer in the 10th inning. There wasn’t much else John Lackey could do once he walked off the mound after the ninth inning. He had handcuffed the Minnesota Twins, striking out nine and giving up just three hits. It was one of the best starts of his career. Only five other times had Lackey gone nine innings and given up three hits or fewer, and not surprisingly he walked off with the win on each occasion. Lackey wasn’t necessarily opposed to coming out for the 10th. “He had more than done his job,” manager John Farrell said. When Chris Parmelee drilled a 1-and-2 splitter from Koji Uehara for the two-out homer that gave the Twins a 1-0 lead in the top of the 10th, Lackey was no longer a part of the equation. The game then hinged on the Red Sox’ offense. Even though they were 1 for 29 at that point, when Farrell looked at the batters he had coming up in the bottom of the 10th — Dustin Pedroia, Ortiz, and Mike Napoli — he liked his chances of getting a run. After playing a season-long game of cat and mouse with the big hit, the Sox didn’t just get one, they got two. Ortiz shot a 2-and-2 slider just in side Pesky’s Pole to tie it, and Napoli launched a 0-and-2 fastball out to deep center, as the Red Sox walked off with a 2-1 win. It felt like forever since the Sox had hit back-to-back home runs, but it was only April. The celebration when Napoli tossed his helmet toward the home plate and barreled into the pile of teammates there to meet him was a cocktail of exhilaration and relief in this claustrophobic stretch of five straight one-run games. The Sox are 11-15 in those games and 5-6 in walkoffs. It was the first time in Sox history, according to the Elias Sports Bureau, that the Sox swept a three-game series by scoring just five runs. Twins starter Kyle Gibson had the Sox on a leash for seven innings, retiring the first 14 batters he faced and allowing a career-low one hit. Lackey became the first Red Sox starter to throw nine shutout innings without earning a win since Matt Young did it against the Indians in 1991. It was Lackey’s 12th quality start this season, and in his last six starts his ERA is 1.60. Getting the win — even if it doesn’t show up in Lackey’s record — was important for the offense. With a 10-game road swing through Oakland, Seattle, and New York on the horizon, the walkoff win ensured the Red Sox would pack some momentum.